With McDonald’s introducing its new “Create Your Taste” kiosk and inviting diners to make their own burgers in select outlets, it was only a matter of time before some clever denizen of the internet took the fast food chain to task and forced them to make something huge, grotesque, and basically inedible. 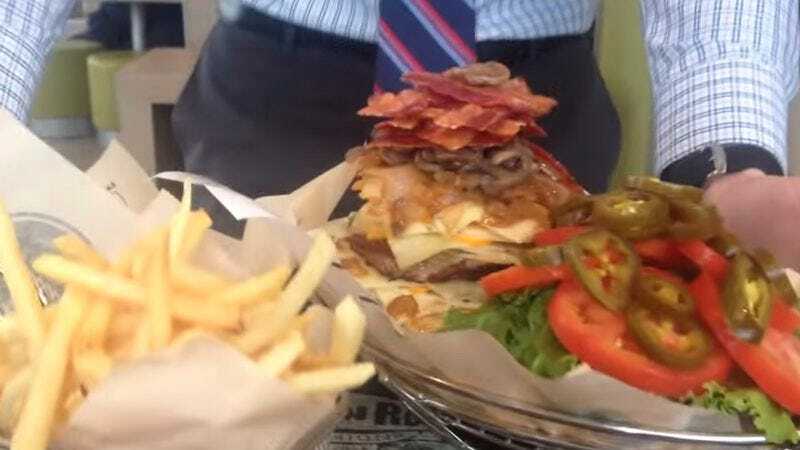 Enter Moshe Tamssot, who charged his local McDonald’s with producing what he dubbed “The Big Max”: two quarter-pound patties, 30 slices of cheese, and as many toppings and thick white sauces as the machine would allow. Tamssot taped the whole thing, and the resulting 3.8 pound monstrosity is pretty gross, albeit understandably. Still, good on McDonald’s for playing along with this whole thing. The restaurant’s manager even brings him a little basket for his extra lettuce and tomato, just because. That’s hospitality.